There have been many attempts to reproduce an interactive experience, some have added to the experience. Whatever you thought of Lost, the internet web that the show wove added hours of conspiracy discussion for fans. 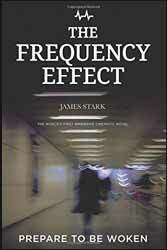 A new interactive project arrives in the form of James Stark's first immersive novel, The Frequency Effect (2016. 261 pages). The book links into elements on the internet which the reader will access at certain times. While the novel isn’t particularly good, I suspect that the author would contend that it is but a single element of the experience. But considering the time that is required to read it compared to the short online sequences, it’s most of the project as far as the reader is concerned. It often feels like language has been used for impact rather than beneficial effect, the conversations are often short and robotic in nature, though this may have been the intention it does little to grab the reader’s attention. There is also an overuse of descriptive couplets, there is rarely anything in the book which does not come married to some form of associated description. Gaining access to the immersive experience turned out to be difficult. There is a URL - Thefreqencyeffect.com/immersive – printed in the front of the novel which finds no server, so I tried Google which led me to http://www.thefrequencyeffect.com/ this opens a page which allows you to navigate to the pieces of video which put you into Bens experience. So, the first link has you in Bens head as he wakes up in a hospital accompanied with a music track which reflects some of his experience, it’s a nice VR experience, but nothing unusual. The second is a sparse advert for Tatio, the nefarious technology company which holds populations in thraldom. You can peruse them at your leisure, however the book has prompting symbols which indicates which link to click on. Timewise, the greater bulk of the content is taken up by the London band, The Split Lives. There is a sophistication which indicates that some money was thrown at the project, but not a convincingly enough to live up to the promise of being either particularly interactive or immersive. I can’t help feeling that the project would have worked better as a completely online experience, where links could lead to other information, interweaving the story with other content and even allowing for a more labyrinthine experience. We could have seen the video’s breaking through the text, I would have been happy with anything which either challenged the way information is consumed or challenged that consumption. It’s an interesting idea and as this is supposed to be part of a trilogy it may well morph into something which is truly immersive, but as it stands its disparate elements are neither blended nor interactive.